Sanitizing high-touch objects in non-critical care areas can be broken down into products, steps and frequency. Even though labor costs will often prohibit the dwell times required to disinfect surfaces in non-critical areas, I prefer to use the appropriate EPA-registered one-step detergent disinfectant to clean by spraying and wiping HTOs with color coded microfiber cloths. The process cleans the surface by removing the soil and germs with the microfiber cloth so the disinfectant can continue to do its job as opposed to the non-kill properties of an all-purpose cleaner. At the very least, we are sanitizing the surface by cleaning it and providing further kill in the wet or damp cloth, preventing the transfer of germs to other areas and/or surfaces. Let’s say the two people Dan is referring to are you and your customer, and the contract is for a multi-use building. If the contract’s scope of work does not state (and budget for) which HTOs are cleaned, how and how often, then what is your customer’s assumption? The assumption is probably a high expectation that you have this subject covered. What if there is a MRSA outbreak amongst the occupants? Questions start flying and fingers start pointing. 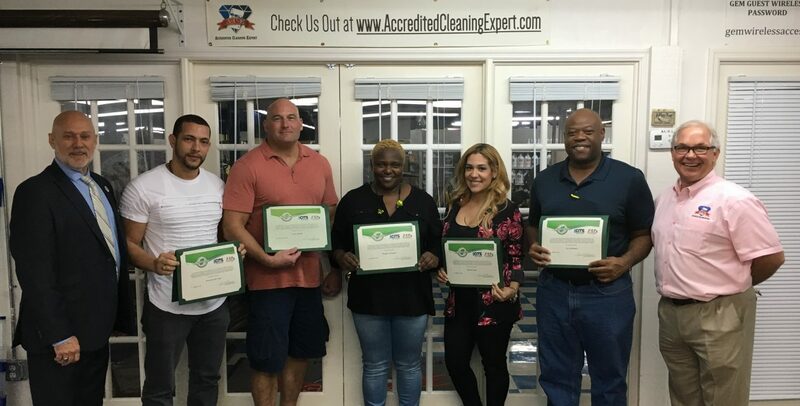 The best practice is to accurately define the cleaning specifications to allow the labor required to clean and sanitize all HTOs in a building. That is feasible for new contracts. For existing contracts, be proactive and review current policies and procedures. Rewrite policies if necessary, retrain employees and document the training. Springtime means storm season for most areas of the country. Spring storms can create facility challenges, such as entry-way cleanliness and safety issues, water damage, and more. To help you with these seasonal weather-related facility challenges, we’ve developed a few tips for facility managers and cleaning contractors to help ensure that your facility is clean and safe for building occupants. 1. Freshen up facility appearance: To maintain the building and to improve the appearance of your facility overall, take time to address small maintenance issues such as changing light bulbs, touching-up paint, and replacing entry-way matting. 2. Entryway Safety: Springtime brings storms and wet weather conditions which can create safety hazards for building occupants. Be sure to invest in new matting systems or clean existing matting at all building entrances and exits. Spring is also a good time to perform floor care equipment maintenance, or if appropriate, invest in new floor care equipment that will address spring cleaning challenges. For example, wet-dry vacuums or air-movers are important to keep entryways safe and dry. Additionally, make sure your facility has enough “caution wet-floor” signs to use at entrances and exits during rain and storms to minimize slips and falls. 3. Focus on flooring: Winter weather can really take a toll on your facility’s floors. Restore your hard floors and grouted tile in the spring by cleaning them with cylindrical brush floor scrubbers. When it comes to restoring carpeting, deep-clean carpets with moisture-controlled carpet extractors to bring the fabric back to its original beauty. This deep-cleaning process also helps to extend the longevity of your facility’s flooring assets, and can delay expensive replacement costs. 4. Deep-Clean Restrooms: The Spring is the perfect time to consider implementing a no-touch deep cleaning system for restrooms that effectively removes built-up soils by sanitizing all restroom surfaces and fixtures. 5. Maintain and Clean air conditioning units: To lower your energy bills and ensure the best indoor air quality (IAQ) for building occupants, facility managers should complete a comprehensive A/C coil cleaning service. Completing regular A/C coil cleaning removes dirt, grime and built-up sludge from A/C units which can improve IAQ, lower energy bills and extend the life of air conditioning units. 6. Begin Using Environmentally-friendly Products and Cleaning Practices: According to a recent Harris Interactive survey, 84% of U.S. adults prefer to do business with a company that uses environmentally-friendly products and practices. Be sure to select products that meet the requirements of the EPA’s Designed for the Environment Program (DfE) for safer chemistry, or Green Seal certified products. What’s more, businesses can implement green cleaning methods such as the use of low-moisture dilution control chemical dispensers on hard-floor automatic-scrubbers, moisture- controlled carpet extractors that reduce moisture and improve carpet drying-times, and switch to reusable mops or surface wipes to limit environmental impact. Tips provided by CFR Corp.